By the time I can no longer denied the necessity of buying a car, I realized it wasn’t that hard when you have people that can help you out find the right car. 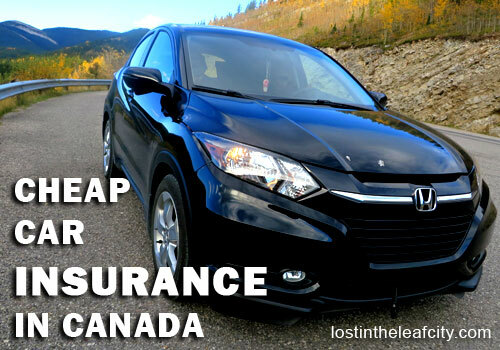 When it comes to finding a cheap car insurance in Canada, I didn’t do well in getting the best deal as a new driver. A year later, I found a way to save time and money on car insurance. So in this post I’ll show the steps on how to find a cheap auto insurance. Whether you’re a new driver or have been driving for a long time, somehow you can pick up one or two useful tips from my journey as a newcomer driver who has never driven anything other than a bike before driving in Canada. Before you start looking for another insurance company because you’ve received a high car insurance quote prior to renewal, I suggest to give the company a call first. Ask the reason of the increase and what’s the possibility of getting a discount. I did just that and told the customer service that I’ll shop around for lower quotes. And I’m glad I did. You DON’T have to take the current car insurance quote. With the use of an online comparison tool, you’ll have a choice; lots to choose from. Did you know that a driver’s training course could help you save on car insurance but not all driving schools are accepted by insurance companies. When I was a new driver, I used Google Map to compute the car mileage. Then I found out about the AA Mileage Calculator; this is the most convenient (use an address) and accurate among the online calculators I’ve tried. After all the tips and going through the filing cabinet, it’s time to use an online tool. Looking for a cheap car insurance in Canada is time consuming. I had to get an insurance quote online on different websites, then someone would call to which I would respond that I’m still shopping around (because the quote is way too high). Then stumble upon Kanetix, an insurance comparison tool. In this post, I’ll show you how I was able to save. Go online to get a car insurance quote. Check the email with a list of car insurance quotes. Use the Quote Reference Number. The email I received has seven quotes but there was a catch. The cheapest car insurance quote is a mystery. I didn’t have an idea what insurance company is it; all I know is that the quote is 13% lower than my current premium per month with the same coverage. I called the number, gave the reference number, and confirmed the information I submitted online. That was it. Do you think it was fast? It was except the time when the conversation led to insurance coverage, the crucial part. Know what you are getting and paying for. Remember, the main goal is not to get the lowest quote but to pay the premium with the right coverage. You don’t want to overpay nor misunderstood the policy. Give the information online ONCE. Get and compare insurance quotes without calling any insurance company. Use more than one comparison tool to test the accuracy and have more choices. Avoid phone calls from countless insurance companies. If you ask me if I will recommend an insurance comparison website, I’ll give a resounding, YES. But don’t forget to ask friends and family. Use all the resources and tips to get the best car insurance in Canada. Which reminds that my first insurance was a recommendation from a friend. A year later my friend had a great deal on the insurance company that I recommended. It pays to shop around. You don’t have to stick around with the same insurance company or broker. Ask for recommendations but call the customer service first of your current insurance company. Loyalty is sometimes rewarded with discount. Insurance premium increases … for some. My friend’s premium tremendously increase because of high car mileage and the car is bought brand new. Is it still reasonable? Pay the insurance premium within your comfort. The premium is paid through pre-authorized debit (PAD) every month or one-time payment through credit card. There’s going to be more things to learn as I go through life, driving and listening to songs on the radio I can never remember the title. Share your tips on the comment or even song best for cruising. The comparison tools are for people not only looking for auto insurance. You can compare different types of insurance such as home, travel, life, health, mortgages, and credit cards. Did I miss a website? Let me know in the comment and I’ll update the list. The next time I have to renew my car insurance, I’ll definitely compare more quotes. I’ll have the chance to see accuracy of the results and efficiency of the online tools. That only means more car insurance reviews for future blog posts. Have you tried going online to get an insurance quote? Share your tips in the comment on how you get the best deal on premiums. Great article with amazing insights. Car insurance is one of the most important things after the car itself. Investing in the right insurance plan always helps you out in the longer run. While buying my previous car, the experts at Haus of Cars guided me through the various options I had for insurance plans and also gave me a good deal for the car and the insurance.